“I am just going outside and I may be some time”. Those were the last recorded words of Captain Lawrence Oates, who stepped into a blizzard in Antarctica on 16th March 1912 and was never seen again. The recorder of those words was Captain Robert Falcon Scott, who kept a diary until shortly before his own death some two weeks later, also defeated in the attempt to survive the terrible conditions of the southern continent. Lawrence Oates was born in London on 17th March 1880 into a well-do-to family that provided him with an Eton education and the pleasures of gentlemanly life. He became particularly interested in hunting and horses, and it was his expertise with the latter that made him a suitable candidate for Scott’s expedition to the South Pole, which had never been reached before. Another plus point was the fact that he was able to contribute one thousand pounds to the cost of the expedition, which was a considerable sum in 1910. Scott knew that he was in a race to be first to the Pole, his rival being the Norwegian explorer Roald Amundsen. However, the tactics of the two expeditions were different. Whereas Amundsen was going to rely on a pack of more than 200 dogs, some of which would be slaughtered to feed the survivors as the journey progressed, Scott was horrified by this idea. Instead, he wanted to take a much smaller team of dogs and use ponies as pack animals to carry supplies to the depots they intended to set up along the way. The ponies were to be bought from a source in Siberia, the idea being that these would be used to working in extremely cold conditions. 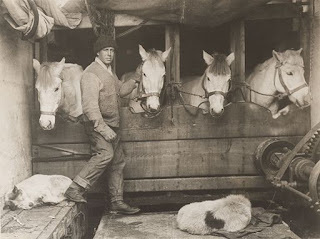 What Scott should have done was send his horse expert, Oates, to Siberia to select and buy the ponies, but he did not. When Oates saw the ponies that had been bought, and which were collected from New Zealand on the expedition’s way south, he was alarmed by their poor condition, describing them as a “wretched load of crocks”. Oates was to continue to have a poor opinion of Scott and his ability to lead the expedition. Another point of contention was Scott’s plan to establish the final depot, named “One Ton” for the quantity of supplies it would contain, which was too far from the Pole for Oates’s liking. Oates argued that if the weakest of the ponies were killed and fed to the dogs, it would be possible to site the depot ten miles closer to the Pole, thus shortening the distance that would have to be covered by men dragging sledges. However, Scott rejected the idea, saying to Oates that he had had “more than enough of this cruelty to animals”. For his part Oates clearly distrusted Scott, as revealed in his letters home. He wrote: “The fact of the matter is he is not straight; it is himself first, the rest nowhere”. When the final team of five reached the Pole on 18th January 1912 they found that Amundsen’s well-organized expedition had beaten them by more than a month. Oates wrote of his admiration for the Norwegians in his diary, stating that: “That man must have had his head screwed on all right”. The clear implication was that Scott had not. It was now a case of returning the way they had come, the first objective being to drag the sledges the 120 miles to One Ton Depot, which they would have expected to do in about three weeks. However, the weather turned bad and temperatures plummeted, resulting in severe frostbite. As progress slowed, the food supplies began to run out. After four weeks of battling against the elements, Petty Officer Edgar Evans died, although Scott noted that this did at least meant that the food would last longer. The condition of Captain Oates now held everyone back. It is doubtful whether he should have been allowed to be one of the final five given the opportunity to reach the Pole, one reason being that he carried an old and serious war wound (on the thigh) from his former service as an army officer during the Boer War in 1901. He had, after all, served his purpose as an expedition member now that all the ponies were dead, and Scott’s reason for selecting him for the final push seemed to be out of sentiment rather than anything else. It is hard to see a modern expedition allowing someone with such a handicap to take the risk of facing such extreme conditions. Oates’s frostbite had become gangrenous and every step was extremely painful. Even worse was the fact that it took him two hours every morning to get his boots on, with everyone else having to wait while he did so. He knew that he was holding the others back, but they persuaded him to keep struggling on, although they also knew that their own chances of survival were worsening by the day. On 11th March Scott issued every man with 30 opium tablets, which was in effect a suicide pill that gave them all a choice of whether to keep going or give up. However, nobody chose the easy way out. Oates eventually realised that he had to make that choice, and he did it in a way that would inconvenience his colleagues as little as possible. Scott and the others knew that Oates was committing suicide when he walked out of the tent. Whether Scott was correct to write in his journal that they tried to dissuade Oates we can never know. Oates had himself described Scott as “not straight”, and this could have been Scott’s way of trying to exonerate himself from agreement with an act that might just have been enough to save his own life. In the event, it was not. Scott and the others died some two weeks later, ironically just eleven miles short of One Ton Depot. Had it been sited ten miles further south, as Oates had suggested, would that have been enough to save them? On the other hand, would the extra eleven miles have been covered if Oates had taken his opium tablets five days before his final act, thus speeding the progress of the others? This is, of course, open to speculation because the answers can never be known.